The facility features top quality Morton brand construction. Numerous skylights keep the facility bright all day. Eight large doors provide great ventilation during good weather. Ceiling fans in the aisle and individual box fans on each stall provide excellent air flow and cooling in summer months. The perimeter of the property is fenced for safety and security. The gate remains locked whenever staff leave the property. The 23 stalls and indoor arena are located under one roof. During inclement weather, you can stay warm and dry from the time you enter the facility. Our lighted indoor arena measures 72' by 132'. 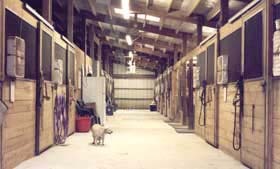 In addition to being able to ride during the winter months and during rain showers, the shade of the indoor arena is very welcome in the hot summer months. Our fenced outdoor arena measures 120' by 236'. The arenas are never closed to our boarders during lessons or clinics. 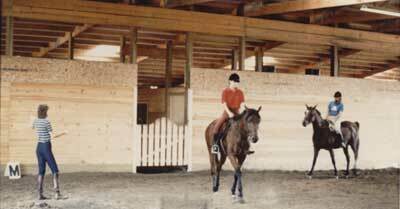 Both arenas are large enough for several horses to be ridden at the same time. Comfortable box stalls are 12'6" by 12'6" in size. They consist of 2" by 6" tongue in groove oak boards on the lower half and vertical bars on the top. This allows for maximum ventilation and socialization. Four stalls have solid walls on both sides for horses who are happier not seeing their next door neighbors. Stalls are located on both sides of a 12' wide aisle. Sliding stall doors keep the aisle clear, safe, and accessible. 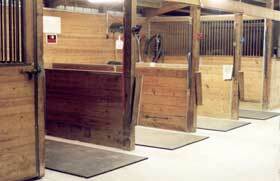 Four grooming stalls are located across the aisle from the tack room. These individual stalls are provided for grooming and saddling horses. This eliminates the need to cross-tie horses in the aisle. The grooming stalls have electric outlets for clippers. 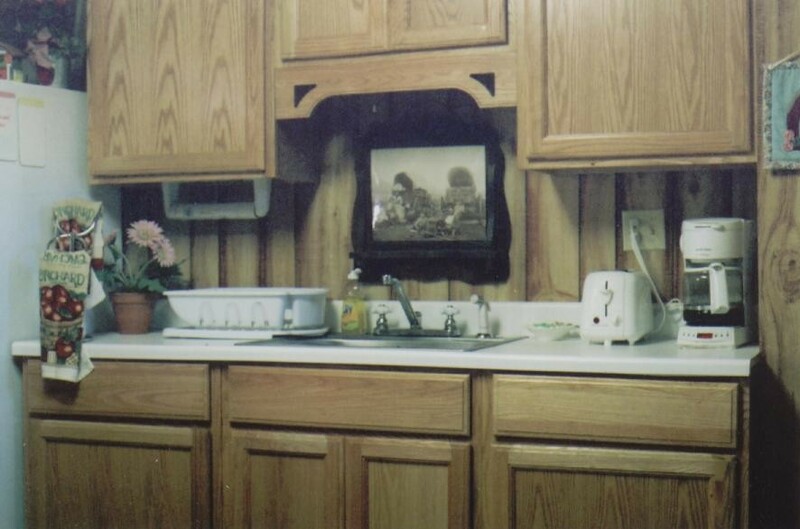 The locked tack room has individual cabinets for each boarder and plenty of room for saddles and tack. A dehumidifier operates during humid summer months to protect the leather stored there. The indoor wash stall has hot and cold running water and lights. An outdoor wash rack is also available. A modern restroom is located inside the facility. A heated and air-conditioned lounge is equipped with a kitchen complete with refrigerator, microwave oven, table and chairs, sofa, and TV with VCR. 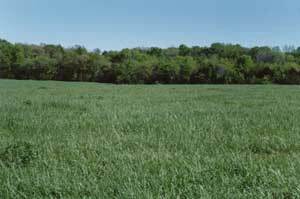 We have approximately 10 acres available for pasture boarding. Mares and geldings live together in the pasture. They have fresh water and salt available at all times. We provide good quality grass hay at all times during the winter months and supplement their diet with alfalfa hay during really cold weather. Our pasture boarders enjoy complete use of the facilities. Much of the property is open and available for riding outside of the arenas. 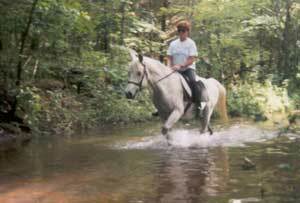 There is a small creek where you can teach your horse to cross water or just cool off on a hot summer day.